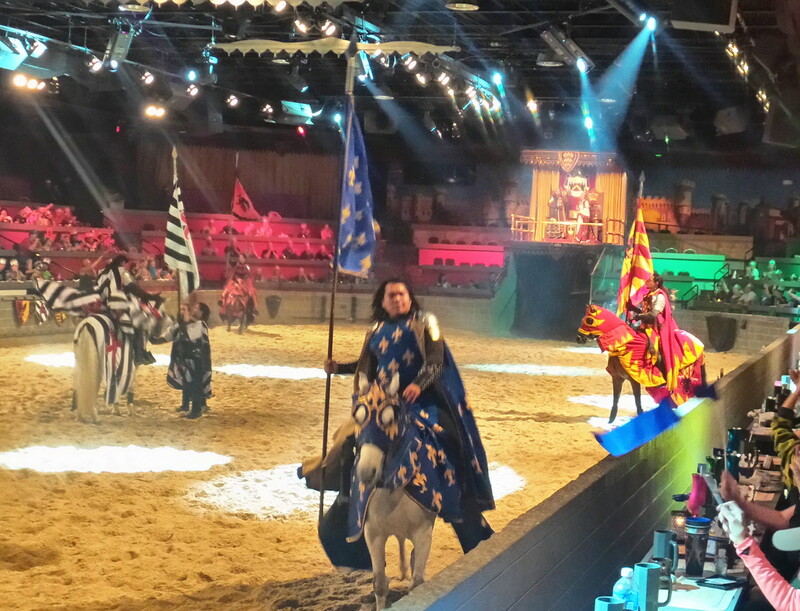 The longest-running dinner attraction in North America, Medieval Times Dinner & Tournament’s Myrtle Beach Castle provides a variety of 11th-century features that delight guests of all ages. From jaw-dropping jousting acts and exciting swordplay, epic fight choreography and a delicious four-course meal, this one-of-a-kind dinner show keeps guests entertained from start to finish. There is a vegetarian meal option available upon request. Arrive early for pre-show entertainment. 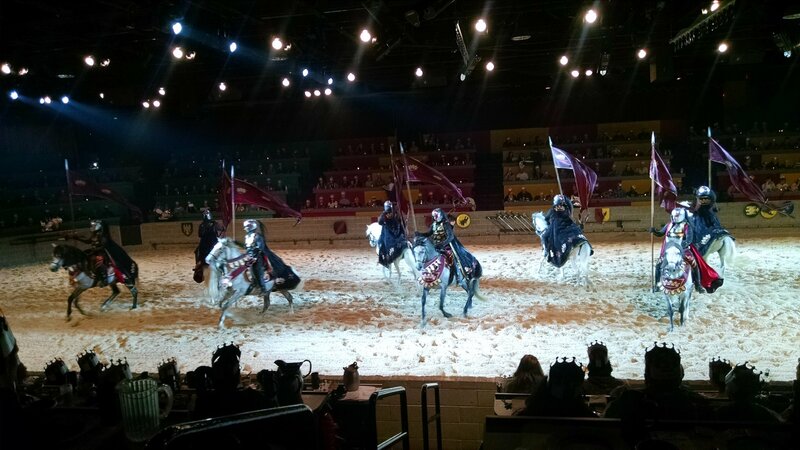 Watch epic displays of horsemanship, extreme jousting and swordplay, and cheer your knight on to victory. 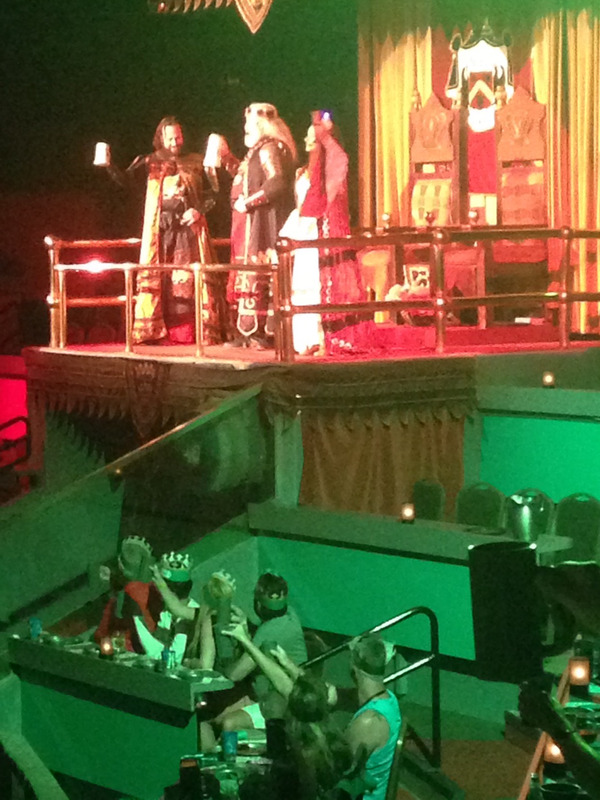 Medieval Times Dinner & Tournament features an ALL NEW SHOW! 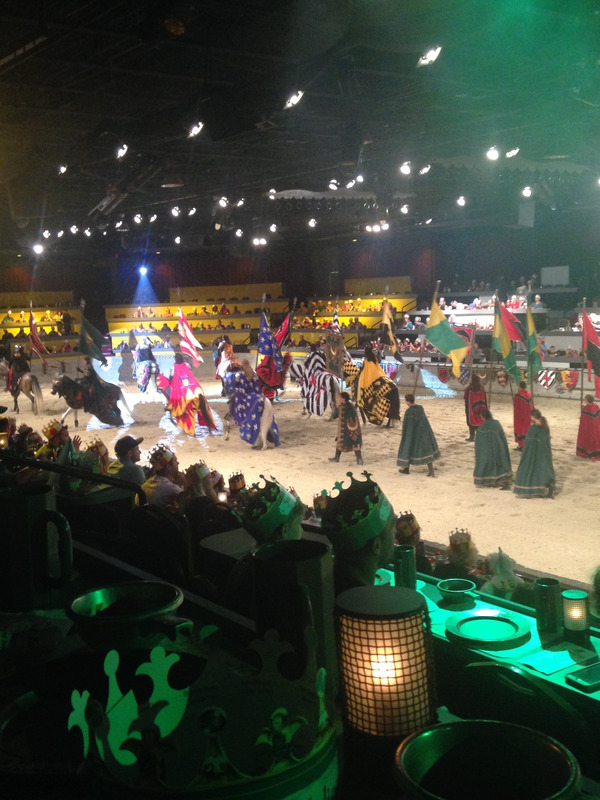 You’ll find even more chivalry, revelry, and rivalry at Medieval Times Dinner & Tournament’s Myrtle Beach Castle. North America’s longest-running dinner attraction has crafted an all-new production that now you are invited to experience! It’s MEDIEVAL like never before, with even more action-packed fun, all new tournament games and a re-imagined feast, fit for a king. The fantasy comes alive as you travel back in time to the 11th-century spectacles of jousting, swordplay, horsemanship, and falconry abound; a time of Spanish castles, Knights of the Realm and feasting in a true medieval fashion-utensil-free! 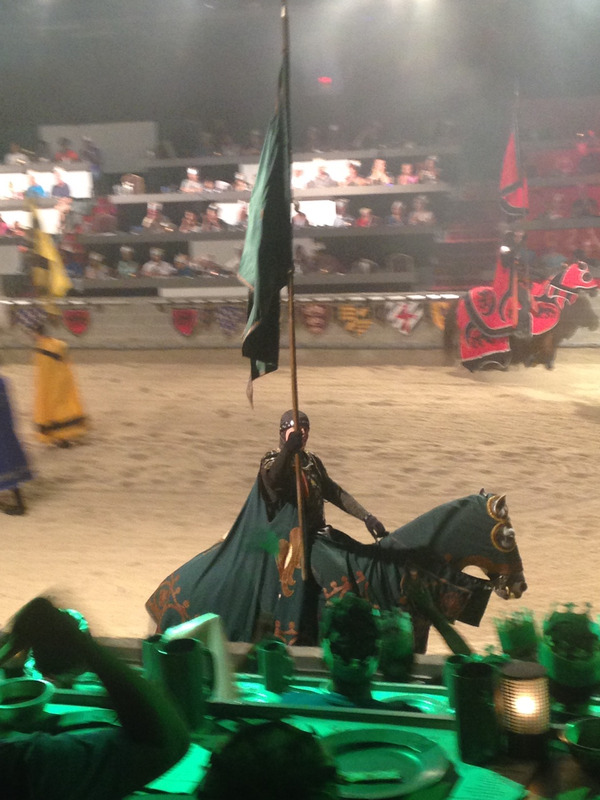 The Show: You’ll still be encouraged to cheer for one of six brave Knights of the Realm! The new production features amazing lighting, costumes, choreography, exciting battle scenes, new horse dressage elements and a fresh musical score by the world renowned composer Daniel May. The Andalusian Stallions: While most of the royal subjects stand on their own two feet, the most celebrated members of the Kingdom are best known for their trot, gallop, and canter. The Feast: The new, upgraded feast shall be served! 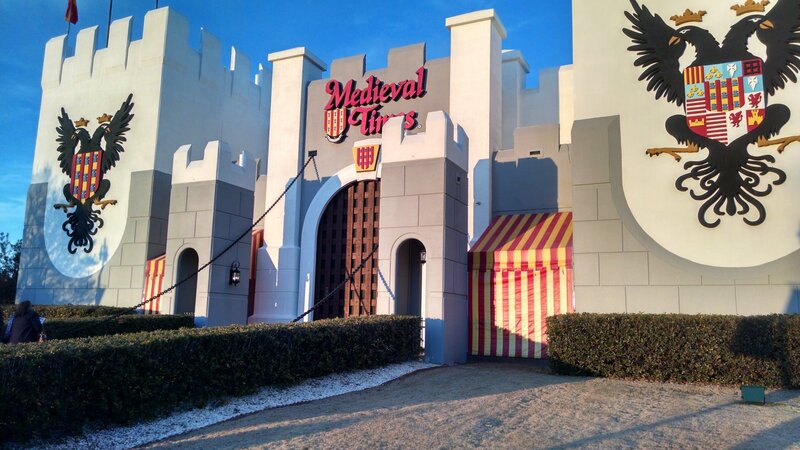 The standard menu at Medieval Times consists of garlic bread, creamy tomato bisque soup, roasted chicken and spare rib, herb-basted potatoes, and pastry of the castle. A vegetarian meal is available upon request. Are you ready to surrender to an age of bravery and honor? 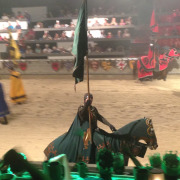 It’s going to be epic so hang on to your helmets the show is about to GET MEDIEVAL! 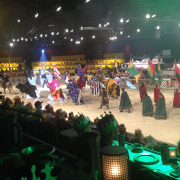 Medieval Times is celebrating 30 years of feasting and fun in North America. The founders first launched their unique idea for an 11th century-style dinner attraction on the Spanish island of Majorca in 1973. This imaginative new entertainment spot was inspired by the true medieval tradition of royal families inviting guests to a festival and feast to watch knights compete on horseback. Seating is first come, first serve. There is no reserved seat assignment. No cancellation policy on show tickets. 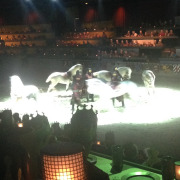 Allergy/Strobe Warning: Medieval Times is a live horse show in an enclosed arena. Persons with respiratory conditions, allergies, or asthma attend at their own risk. 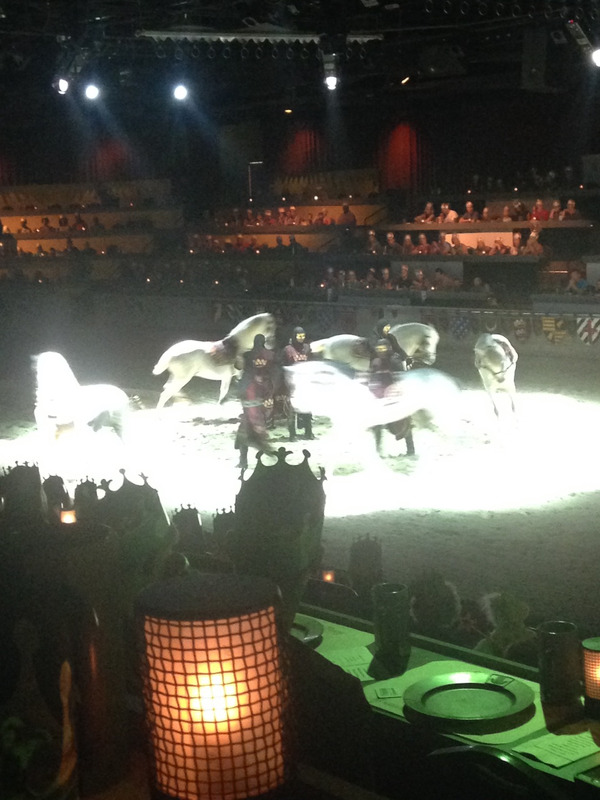 Medieval Times uses stroboscopic and pyrotechnic effects. 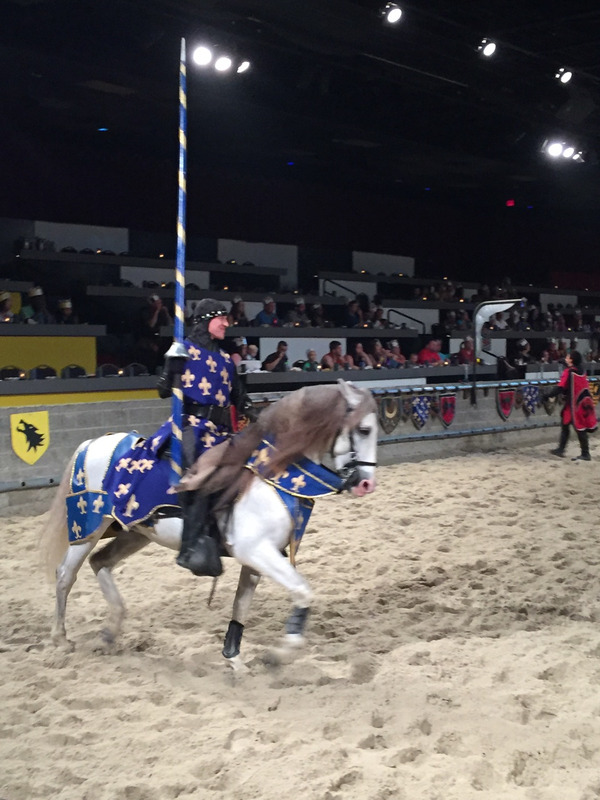 Is there a pre-show guests should be aware of at Medieval Times Dinner & Tournament? There is not a pre-show per se, but the castle does open 90 minutes prior to show time. Knighting ceremonies and photos are taken prior to the show starting. If my child is under 3, are they free? Children under 3 are admitted free as long as they sit on an adult's lap and eat from their plate. If you prefer the child have his own seat or meal, a child rate would apply. Are visitors allowed to meet & greet the performers at Medieval Times? Yes. Performers are available after the show for pictures and autographs after the show in the Hall of Arms. Are cameras, audio or video recording allowed during the show? Cameras are allowed. Audio and video recording are strictly prohibited. 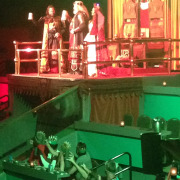 What else is offered at Medieval Times, besides the show? 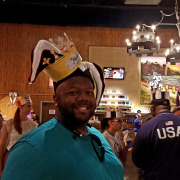 Medieval Times also features an excellent bar, dance floor, Hall of Arms displaying medieval artifacts and medieval torture museum, also known as the dungeon tour. 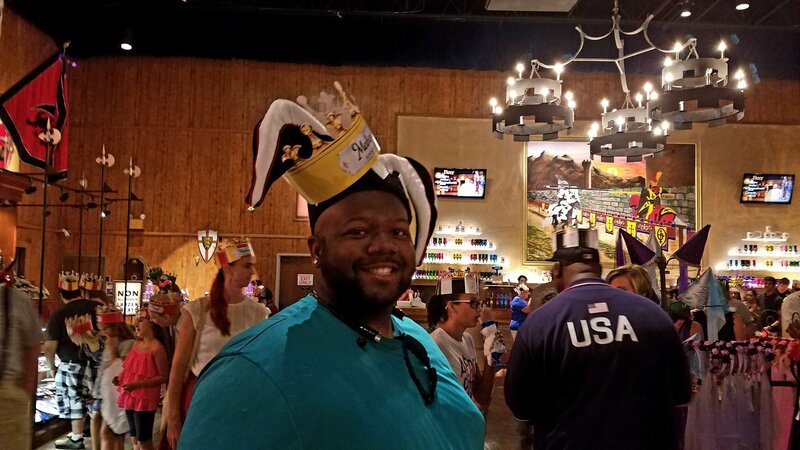 What type of menu is served at Medieval Times? The standard menu consists of garlic bread, creamy tomato bisque soup, choice of roasted chicken, sweet buttered corn, herb basted potato and pastry of the castle. A vegetarian meal is available. It consists of garlic bread, creamy tomato bisque soup, large Portobello mushroom stuffed with whole grain rice and beans, a large skewer of roasted vegetables, hummus with pita chips and pastry of the castle. Soft drinks, ice tea and coffee are included in the meal. Is it true that we must eat with our hands? Absolutely! Eating utensils were not used in the 11th-century and we take you back. Approximately how long is the Medieval Times Dinner & Tournament Show? Does the theater offer handicap seating? No. Seating is first come, first serve. Casual dress is acceptable for this performance.